Aviation Updates Philippines - Start-up airline Pan Pacific Airlines is expanding its flights to Korea starting late-November 2017 in an attempt to capture and entice tourists to visit Kalibo, the main gateway to Boracay island. NEWEST AIRLINE. 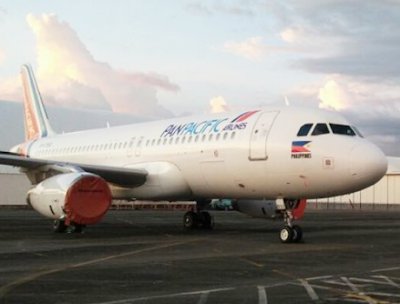 Pan Pacific Airlines is one of the newest start-up airlines in the Philippines. Photo by Pan Pacific Airlines. The airline will be increasing its current Kalibo-Seoul Incheon flights from 1 to 2 daily starting November 21, 2017. The new flights depart Kalibo at 11:45 PM and arrive Seoul at 4:45 AM. The return flight will depart two hours after the preceding flight will arrive. On November 29, Pan Pacific will also launch its twice-weekly services between Kalibo and Busan. Flight 706 departs in Kalibo at 1:40 PM and arrives in Busan at 6:30 PM. The return flight, 8Y707, departs in Busan at 7:30 PM and arrives in Kalibo at 10:20 PM. Both flights will be operated by its 174-seat Airbus A320-232. Pan Pacific operates only two Airbus A320 aircraft which it uses for flights to Seoul Incheon and Muan at present. One more is scheduled to arrive in the future. Pan Pacific Airlines Co Ltd, operating under the Pan Pacific Airlines brand, is a Philippine-registered airline operating scheduled air services between the Philippines and South Korea. The airline, formerly operating as Astro Air International, commenced its operations on April 27, 2017 with the launch of its Seoul Incheon-Kalibo route.